HE incident of Niyala occurred in the middle of the month of Sha'ban, in the year 1264 A.H.(1) Towards the end of that same month, the Bab was brought to Tabriz, where He suffered at the hands of His oppressors a severe and humiliating injury. That deliberate affront to His dignity almost synchronised with the attack which the inhabitants of Niyala directed against Baha'u'llah and His companions. The one was pelted with stones by an ignorant and pugnacious people; the other was afflicted with stripes by a cruel and treacherous enemy. castle. Whatever provisions were required for the Bab were purchased in the old town and transported to His prison. During the Bab's captivity in the castle of Chihriq, events of a startling character caused grave perturbation to the government. It soon became evident that a number of the most eminent among the siyyids, the ulamas, and the government officials of Khuy had espoused the Cause of the Prisoner and had completely identified themselves with His Faith. Among them figured Mirza Muhammad-'Ali and his brother Buyuk-Aqa, both siyyids of distinguished merit who had risen with fevered earnestness to proclaim their Faith to all sorts and conditions of people among their countrymen. A continuous stream of seekers and confirmed believers flowed back and forth, as the result of such activities, between Khuy and Chihriq. penned in the Bab's handwriting, in which He set forth in their entirety the circumstances of that dream and revealed a the exact texts of those verses. The accuracy of that reply brought about a sudden conversion. Though unused to walking, Mirza Asadu'llah hastened on foot along that steep and stony path which led from Khuy to the castle. 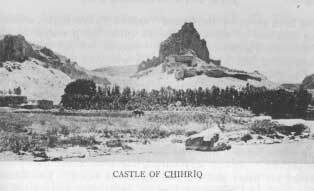 His friends tried to induce him to proceed on horseback to Chihriq, but he refused their offer. His meeting with the Bab confirmed him in his belief and excited that fiery ardour which he continued to manifest to the end of his life. That same year the Bab had expressed His desire that forty of His companions should each undertake to compose a treatise and seek, by the aid of verses and traditions, to establish the validity of His Mission. His wishes were instantly obeyed, and the result of their labours was duly submitted to His presence. Mirza Asadu'llah's treatise won the unqualified admiration of the Bab and ranked highest in His estimation. He bestowed on him the name Dayyan and revealed in his honour the Lawh-i-Hurufat(1) in which He made the following statement: "Had the Point of the Bayan(2) no other testimony with which to establish His truth, this were sufficient--that He revealed a Tablet such as this, a Tablet such as no amount of learning could produce." obstacle to their recognition of the promised One. The Bab had Himself in that Tablet unravelled that mystery; no one, however, was able to understand the explanation which He had given. It was left to Baha'u'llah to unveil it to the eyes of all men. The untiring zeal which Mirza Asadu'llah displayed induced his father, who was an intimate friend of Haji Mirza Aqasi, to report to him the circumstances which led to the conversion of his son, and to inform him of his negligence in carrying out the duties which the State had imposed upon him. He expatiated upon the eagerness with which so able a servant of the government had risen to serve his new Master, and the success which had attended his efforts. A further cause for apprehension on the part of the government authorities was supplied by the arrival at Chihriq of a dervish who had come from India and who, as soon as he met the Bab, acknowledged the truth of His Mission. All who met that dervish, whom the Bab had named Qahru'llah, during his sojourn at Iski-Shahr, felt the warmth of his enthusiasm and were deeply impressed by the tenacity of his conviction. An increasing number of people became enamoured of the charm of his personality and willingly acknowledged the compelling power of his Faith. Such was the influence which he exercised over them that a few among the believers were inclined to regard him as an exponent of Divine Revelation, although he altogether disclaimed such pretensions. He was often heard to relate the following: "In the days when I occupied the exalted position of a navvab in India, the Bab appeared to me in a vision. He gazed at me and won my heart completely. I arose, and had started to follow Him, when He looked at me intently and said: `Divest yourself of your gorgeous attire, depart from your native land, and hasten on foot to meet Me in Adhirbayjan. In Chihriq you will attain your heart's desire.' I followed His directions and have now reached my goal." were issued to transfer the Bab immediately to Tabriz in the hope of allaying the excitement which His continued residence in that locality had provoked. Before the news of this fresh order had reached Chihriq, the Bab had charged Azim to inform Qahru'llah of His desire that he return to India and there consecrate his life to the service of His Cause. "Alone and on foot," He commanded him, "he should return whence he came. With the same ardour and detachment with which he performed his pilgrimage to this country, he must now repair to his native land and unceasingly labour to advance the interests of the Cause." He also bade him instruct Mirza Abdu'l-Vahhab-i-Turshizi, who was living in Khuy, to proceed immediately to Urumiyyih, where He said He would soon join him. Azim himself was directed to leave for Tabriz and there inform Siyyid Ibrahim-i-Khalil of His approaching arrival at that city. "Tell him," the Bab added, "that the fire of Nimrod will shortly be kindled in Tabriz, but despite the intensity of its flame no harm will befall our friends." No sooner had Qahru'llah received the message from his Master than he arose to carry out His wishes. To anyone who wished to accompany him, he would say: "You can never endure the trials of this journey. Abandon the thought of coming with me. You would surely perish on your way, inasmuch as the Bab has commanded me to return alone to my native land." The compelling force of his reply silenced those who begged to be allowed to journey with him. He refused to accept either money or clothing from anyone. Alone, clad in the meanest attire, staff in hand, he walked all the way back to his country. No one knows what ultimately befell him. Son languished in his confinement until the time when his Beloved had reached Tabriz and had been taken back again to His prison in Chihriq. I have heard Shaykh Hasan-i-Zunuzi relate the following: "At about the same time that the Bab dismissed Azim from His presence, I was instructed by Him to collect all the available Tablets that He had revealed during His incarceration in the castles of Mah-Ku and Chihriq, and to deliver them into the hands of Siyyid Ibrahim-i-Khalil, who was then living in Tabriz, and urge him to conceal and preserve them with the utmost care. and shall fall a victim to the fire of the enemy. I shall choose no one except you to share with Me the cup of martyrdom. Rest assured that this promise which I give you shall be fulfilled." I was entranced by the beauty of that vision. When I recovered, I found myself immersed in an ocean of joy, a joy the radiance of which all the sorrows of the world could never obscure. That voice keeps ringing in my ears. That vision haunts me both in the daytime and in the night-season. The memory of that ineffable smile has dissipated the loneliness of my confinement. I am firmly convinced that the hour at which His pledge is to be fulfilled can no longer be delayed.' I exhorted him to be patient and to conceal his emotions. He promised me not to divulge that secret, and undertook to exercise the utmost forbearance towards Siyyid Ali. I hastened to assure the father of his determination, and succeeded in obtaining his release from his confinement. That youth continued until the day of his martyrdom to associate, in a state of complete serenity and joy, with his parents and kinsmen. Such was his behaviour towards his friends and relatives that, on the day he laid down his life for his Beloved, the people of Tabriz all wept and bewailed him."